Thanks again for coming and giving Ruby the best birthday party ever! She was buzzing and it really made her day so special - thanks again! A huge thank you for such a wonderful pet party for my son Zachs birthday. It really was great - the kids were captivated by all the animals and activities (as were the adults). It was amazing how you could keep so many boys quiet for so long! Zach loved it all and still talks of all the reptiles he was able to hold. Just wanted to say a very BIG THANK YOU for coming with your gorgeous pets. Amelia had said the day before this is like a dream Mummy. She loves animals and it was a wonderful way to have her close to them with some of her friends. We appreciate your service very much and will be very happy to pass good words on. I just wanted to pass on our sincere thanks for a wonderful birthday party experience. We have one very happy daughter and all her friends thoroughly enjoyed it too. So lucky the chinchillas came! But all the animals were amazing. You do a fantastic job of keeping everyone entertained and also educated on how to behave around animals. It is so nice to be able to share those animals with lots of kids who have never seen them before. I just wanted to say thank you for last weekend's wonderful pet party, the birthday girls loved it and are still talking about it. It was a really special party for them. Thanks for a fantastic pet party you put on for my daughter and her friends. You are a lovely and entertaining host and the party itself was well thought out and every child thoroughly enjoyed the time you and your pets were with us. I have raved about you to everyone I have spoken to and I am 100% satisfied with the day. We will be looking for an excuse to book you guys again! I just had to write you to thank you for the most wonderful party yesterday!! It was certainly one of the best parties we've had for our daughter, she loved every minute of it! You were amazingly organised, and created such a calm environment for all the girls to enjoy the animals and their interesting behaviours. I was impressed with the variety of animal interactions from the handling, feeding, grooming, creating, and races - you had the children captivated for the entire hour! I have been getting such fabulous feedback from all the parents, and have recommended you highly for future parties. Now all the girls want pets, and my girls are inspired to teach their Gran's dog how to jump through a hoop! Just wanted to email and say what a wonderful time Ruby and all her friends had at her birthday party the other week. Thank you so much for bringing all your lovely animals. The bunnies and lizards were the stand out favourites! Also thank you for your kind and patient temperament and all the wonderful education the kids received from you on taking care of animals. We all thoroughly enjoyed the party, and some kids even said best party ever!!!! Thank you SO MUCH for the absolutely wonderful party!! Girls are in love with you and your pets! Thank you for Sunday, it was a lovely party and the kids were so happy!!! We just wanted to say an enormous thank you for Saturday. Milly had such a fabulous time, and no one has stopped talking about it. You are fantastic with the kids and the animals – thank you!!! Milly is thrilled that Gerald (the tortoise) has now seen her house. I just wanted to say thank you so much for yesterday, the party was amazing and all the children and parents loved it :-) will email some photos for you when I download them. Thank you so much for a wonderful session with your beautiful animals! I have had so many comments from parents at how much their children enjoyed their experience and that it was the best party ever! I wish you every success for the future. Thanks for an awesome party yesterday! Lottie and her friends all had a great time meeting all the animals it was very hard to get Lottie to sleep after all the excitement! I really appreciated all your hard work in making this a really special day. I just wanted to say a big thank you for all your help yesterday – You made the day perfect and Jessica really enjoyed it. 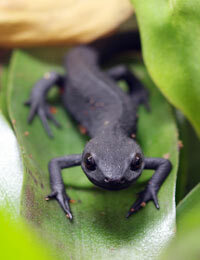 Jessica’s favourite part was holding the newt - thank you for letting her hold it, jess still has a big smile on her face. A quick email to say thank you so much for Zoe's party on Sunday afternoon. It was a lot of fun and the kids really enjoyed the interaction with your pets. Thank you for taking the extra time and showing us the dog tricks, they were awesome. Thank you so much for such a fun, informative and organised pet party on Saturday! We all thought the pet party was so much fun and the way you kept the children’s attention was nothing short of miraculous! We had 16 five year olds at the party who listened with rapt attention to the animal facts and your instructions and loved being able to handle the animals (carefully!) themselves. 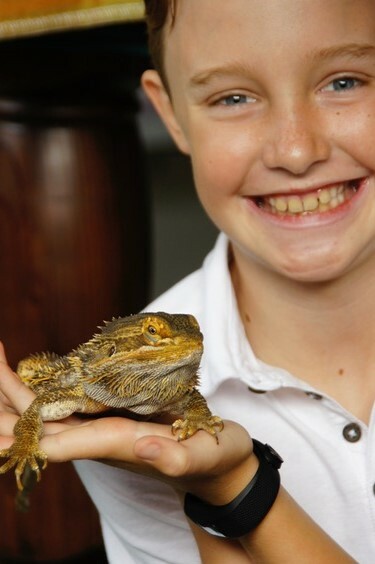 My son loved the reptiles, particularly the lizards, and being able to hold one in his hands was a highlight. As well as the cool animals the kids really related to the easy way you have about you and I was amazed at how you managed 16 children for one hour! The pet party made my son’s 5th birthday so special and one he will always remember. Thank you so much for the fantastic party on Sunday. Paris and her friends loved it!! What a special place you have. Just wanted to say thank you so much for Luke's party on Sunday. Everyone had such a great time and both the kids and parents are still talking about it. One parent gave it a 10/10! Have been meaning to drop you a note to say what a fabulous time was had by all at Emily’s recent birthday party. I was so impressed with your set-up and how you handled the group. Have raved several times to other mums about what a great party it was, how good a job you did, how impressed I was with all the stuff that you brought, and what good value for money I thought it was. A huge note of thanks.....Paris' party was sensational!....the animals, and the range of animals, was fantastic, but over and above that, it was your passion which made the day! Thank you. I just wanted to thank you for giving Lewis a wonderful birthday party on Saturday!! To be able to keep a group of eight year old boys constantly entertained for two hours is a great achievement. The mix of activities and hands on involvement by the kids was geared perfectly to their level, and the opportunities to interact with all the different animals was very special – I am a little envious I wasn’t sitting on the mat with them!! We had to clear the parents off the driveway after the party in order to drive out as they were huddled talking about what a great party it was!! Lewis had a great time. Thanks Sally for the excellent show you put on for the girls for the party Saturday. The girls had such a wonderful time , and they mentioned it was the best party ever. Thanks for coming and showing us your animals. Everyone had such a fantastic time and I couldn’t believe how captivated the kids were (and adults too). We had a really great time and you were so great at doing what you do. It taught the kids to have respect and care for the animals properly. You were so friendly and good with the kids. I would recommend you for any party!! We just want to say thank you so much again for such a wonderful party. We were all so impressed and had such a great experience. You really have a gift with animals and kids!!! Thank you. We all had a fantastic time, I have been telling everyone I know what an amazing place it is for a birthday party! I just want to mention again how absolutely fantastic you were yesterday at Mia’s party. All the children had an amazing time and I must say the chinchilla bath will be something I’ll remember forever. Thanks for making it such a great afternoon for Mia and her friends. Just wanted to say thanks so much for bringing your animals to Anais’ party – the kids had a great time and we were really impressed with your set up. The range of animals (not what you usually find in your back yard!!) and the education you provided with it, made it really interesting for the kids and kept them engaged for the whole hour (I think they were sad it finished) – will definitely recommend. "As a parent and a teacher, I have been involved in alot of children's parties but my daughters recent birthday party, held at the Oracle Education center was, by far, the best. From the very beginning Sally, (the organiser and owner), kept us completely involved in what we wanted/didn't want and even let my daughter come up and work out the games she wanted and meet the animals that she loved the most. All the time Sally emailed and spoke to me to let me know what was going on. It was so well organised. The children got to hold the animals, play with them, had activities around them and also learnt alot. Every child had a ball, and afterwards I had every parent call me to say how much their child was going on about the party, and how much they loved it. Even after a week or so, its all my daughter and her friends are talking about, they absolutely loved it. It was professional, friendly, fun, and the children all loved it. Thank you Sally, you have made my daughters birthday extra special." Thanks Sally and the team at Oracle Animal Education, my daughter Maya and her friends had a great "Pet Party". Everyone was excited to be so hands on, it was a fantastic experience, even the adults enjoyed having a hold of some of your beautiful animals. There was so much to do so there was never a dull moment from when the party started to when it finished. We were amazed at how many animals, birds, fish and reptiles you have and found the party interesting and informative. The kids definitely want to come back and I will be booking them in for a holiday programme soon! We held my daughter’s birthday party at Oracle Education and she had 9 of her friends attend. The party was extremely well organised and was so much fun for all the kids. There were some great activities, and the kids were able to interact with a wide variety of animals. They loved the bearded dragon, and the chinchilla taking a dust bath was fantastic! Everything was so well thought out, and there was a lovely room for the party food to be eaten, and then the activities were in a separate space. Sally and Charlotte put in a great deal of effort and had all the kids entertained the entire time. I can highly recommend having a pet party at Oracle Education. It is a unique and special experience, and all the parents that attended with their children commented to me on what a great idea the pet party was, and how much they enjoyed it. I would definitely do this again! Again a big thank you for the wonderful party that was held for Chantal on the 30th of July, all girls loved it. A big thank you for your amazing patience with the girls and for you impectable service with the animals, my daughter just loved it she was so happy to hold the chinchillia. This is definitely the North Shore's answer to the zoo! My son has never been so excited about a party ever! His mates loved it too and he wants the same party next year. See you then! Just wanted to say thank you for organising the pet party for us at short notice. It was great and it sure made Diya's day. Am sure she wouldn't have complained if Nicole had packed her along with the pets at the end of it! Thank you so much for today, the best party ever!